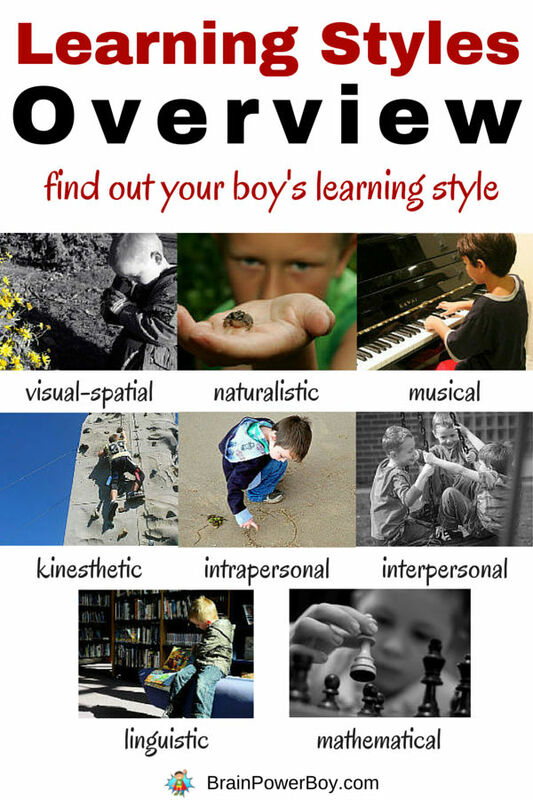 Take a look at this boys’ learning styles overview to get an idea of how your boy learns best. I have never met a boy who did not enjoy learning. The problem often comes when they are forced to learn things that they are not interested in. If you can adapt a boy’s environment to fit his learning style you have given him a special gift. If you have a boy who is struggling with a subject, give boys’ learning styles a try. Read about learning styles below then take the time to observe your boy and think about how he learns. Talk to him about how he takes in information. Here at Brain Power Boy our goal is to help you in “Raising Boys Who Love to Learn!” Learning styles can help. Learning styles are the same for all people but we try to adapt the learning styles to better fit boys and the way they live their lives. You can take this information and use it to help your boy learn—his way. Your boy can learn things in a faster, more comfortable, and easier way by simply knowing his learning styles. I am fond of learning styles because they address some of the issues that stop boys from learning. While passion-driven learning is the best for all children there are ways to make learning more enjoyable when there is something that “needs” to be learned. We have researched the many different models of learning styles. The one that has made the most sense to me, and has worked well for people I know is Howard Gardner’s list of Multiple Intelligences put into easier to understand terms by Thomas Armstrong in his book In Their Own Way . Most people have a combination of learning styles that work best for them. Many people lean heavily toward one or two specific learning styles. While this is true, we are actually able to learn in all of the different styles. For further information on each learning style, click the links below. This will take you to an article on each style. I will help you explore these learning styles and give you ideas for ways to apply them to your boy’s learning. Bodily-Kinesthetic: learn best by moving, touching, and hands-on learning. Interpersonal: learn best by relating and cooperating with others. Intrapersonal: learn best on their own. Linguistic: learn best by hearing, speaking and seeing words. Logical-Mathematical: learn best by looking for patterns and relationships between items. Musical: learn best through rhythm and melody. Naturalist: learn best in the natural world. Visual-Spatial: learn best by seeing images, pictures, and colors. If your boy is struggling a bit with learning, start by changing things up a bit. If he is a visual learner, instead of using a textbook try a video, if he just has to move a lot and is a bodily-kinethetic learner make sure you approach the topic in a hands-on manner. For more ideas see the links to the individual learning styles above where we talk about what to provide, how to help and where to take your boy to honor his learning style. Hey! Did you know you can get more boys’ learning information sent right to your inbox? Subscribe to Brain Power Boy Newsletter today. What learning style does your boy lean toward? What learning style do you think you are? And. . . the big question: Are they the same? As a homeschool mom of ALL boys I could not agree with you more! Each of my boys learn uniquely. I am so glad you broke this down. What an excellent resource for parents. Pinning for sure! This is very interesting information! I’m going to pass this on to my daughter who has a little guy. Thanks for the tips! My boys for sure have different learning styles – my oldest needs to see, touch and do in order to stick with him. My younger boy looks at things at the logical end and asks lots of questions and compares it to other examples. So fun to see them learn! Howard Gardner’s List of Intelligences was always on at least one exam every semester during my elementary education college days, so I was happy to see you mention them here AND that you’ll be sharing more– Great breakdown of this information– this is awesome!!! Thanks for the nice comment Mitzi. I like Gardner’s list because it seems very logical. Thanks for stopping by. Thank you for sharing this important information. Everything makes so much more sense when we realize that not everybody thinks exactly the same way we do. I believe this and unless you homeschool I think its tough for the kids out there. I work at a school and you cant adjust to everyones learning. Someone gets left behind. My son was very difficult and I didn’t have the ability to homeschool him and he still struggles as an adult. Is there any easy ‘test’ to identify learning style. I’m not really sure what style my child uses best. There are some tests available. I prefer observation over time but you can certainly try a test or two. Because I have not used them I do not have a specific one to recommend. You can google “learning styles questionnaire for students” or “learning styles quiz.” You can also click the links on this overview to go to each learning style page as that will give you a better grasp on each individual learning style. I hope that helps! Thank you for your question and for stopping by. I’ve put “In Their Own Way” on my must read list. At what age these styles start solidifying? With a 2.5 year old, I read the links on some styles before others (e.g. I’m likely raising an engineer), but having finished them all I’m questioning how dominate specific learning styles are. Is it possible that this is due to age? He’s very developmentally advanced for his age almost across the board, left-dominate/ambidextrous, bi-lingual, and genetically predisposed to be intelligent in a traditional sense. Alternatively, he has musical, gross and fine motor skills that are very dominant and not parental characteristics. I read the Naturalist post last, expecting it to be the least applicable and I am just perplexed. Can one have a near even distribution of learning styles like one can be ambidextrous? I discovered your site through your Lincoln Log Catapult post, and I love it. While frequently targeted for boys older than mine, I cannot tell you how excited I have been to find this resource! Thank you and great work! I think you will start to see how he learns best soon. I really feel that learning styles shift as a child grows and as their brain develops. As their interests change there can be shifts as well. I have sent you a personal message with additional information. Thanks much, Lolly. I appreciate you taking the time to comment and am glad you like the overview. You are so right that knowing their learning style can help a lot. Thanks for stopping by!